Here’s one of the most important automotive eCommerce trends. While consumers search for an automotive eCommerce website, they also actively search for manufacturer websites, too. 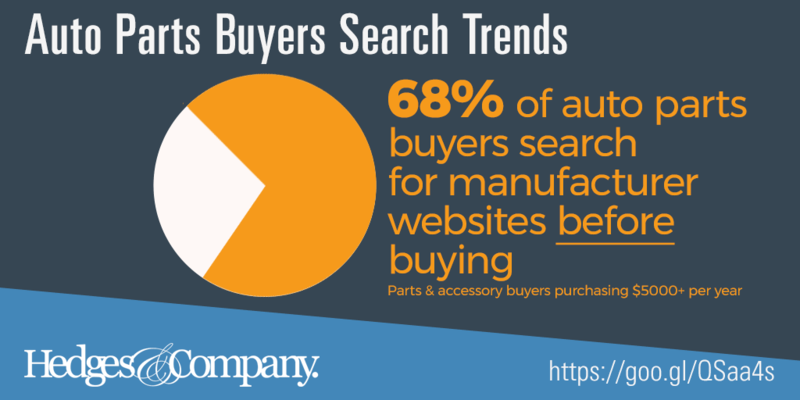 Enthusiast auto parts shoppers actively search for manufacturers’ websites before making a purchase, whether buying online or in a traditional brick & mortar retail store. Even if they’re searching for an auto parts eCommerce website. 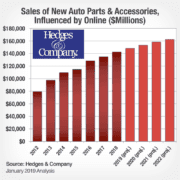 It’s a growing trend, along with the overall growth in digital influence on auto parts sales. But why is this happening? With all the marketing done by auto parts eCommerce websites, why are so many consumers searching for manufacturer sites? For one thing, DIYers research far and wide before they buy. We turn to research to explain this industry trend. If you’re a manufacturer, you’re really going to want to scroll down to see Reason #7. 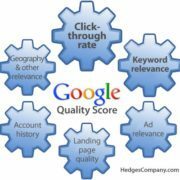 Any auto parts retail industry analysis will tell you that nearly all auto enthusiast shoppers search online before making a purchase, either online or offline. That’s a given. We say it’s 92%, some studies show 90%, and others show 88%. It doesn’t really matter, pick a number. What is less known is the number of consumers actively searching for manufacturer websites. Nearly three out of five average shoppers – 57% – search for a manufacturer’s website before making a purchase decision. When it comes to the biggest spenders, those consumers who spend more than $5,000 per year on auto parts & accessories, that number jumps to 68%! 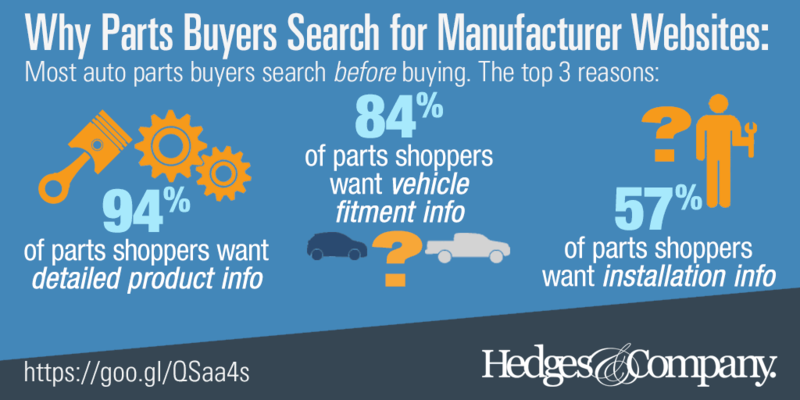 Even with auto parts retailer sites spending millions on paid search and auto parts SEO, manufacturers are still the third most popular source of information for parts shoppers before making a purchase. 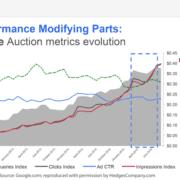 Let’s dig into why this auto parts search pattern is occurring. This is important, too, if you’re selecting your next auto parts eCommerce platform. 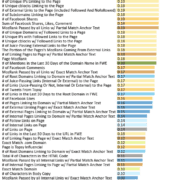 The biggest reason cited by enthusiast car parts shoppers for visiting manufacturer websites is they want to see detailed product information. Don’t ignore this automotive eCommerce trend if you want online visibility! 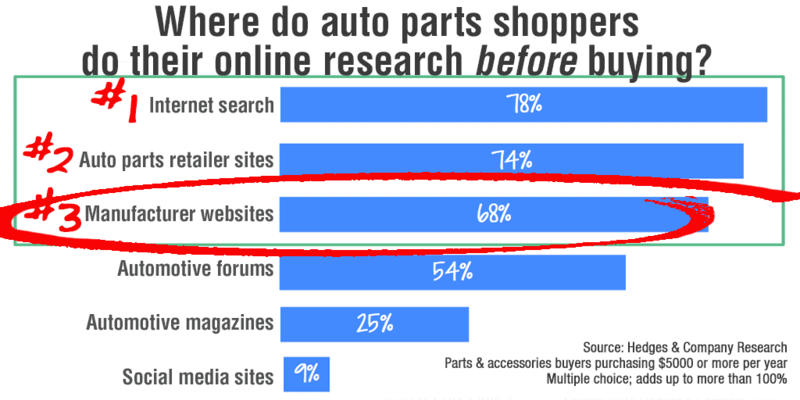 This was by far the single most popular reason, given by 94% of auto parts shoppers looking for an automotive eCommerce website. This was a multiple choice question, and the answers add up to more than 100%. Auto parts eCommerce retailers should look at this and evaluate their own sites for product content. Do consumers get enough information on a product to have the confidence to place an order? 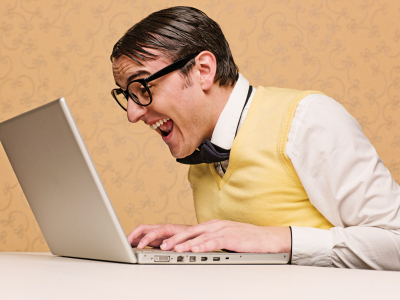 You don’t want a shopper leaving a website and contributing to a higher bounce rate. One quick way to drill down into product pages lacking content is to use Google Analytics. Search for product pages with high bounce rates or low conversion rates. Wait a minute, does this reason make any sense? A shopper is on a retailer website, ready to make a purchase, but can’t tell if a part fits their own vehicle? Sadly, yes. This is one of the most important automotive eCommerce trends. This answer was given by 84% of auto parts shoppers. In today’s auto parts eCommerce world, there is no excuse why a shopper on a retailer’s website should not know if a part fits or not. Especially considering the resources available in the automotive aftermarket for product accurate parts data and fitment information. This is the third most popular reason in our analysis of automotive eCommerce trends. Enthusiast shoppers search for manufacturer websites for installation information. You’d expect manufacturer websites to have more information on installation of their parts. 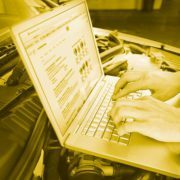 Fifty-seven percent of auto parts shoppers said they went to manufacturer website to look at installation information before buying a part from any automotive eCommerce website. But any auto parts eCommerce website should have all the information needed on how to install a part. Here’s why: If a shopper leaves a retailer’s website to visit a manufacturer website, that increases the odds that shopper will never return to the original auto parts eCommerce website. The fourth most popular reason, given by 50% of shoppers, is they visit manufacturer websites in order to find out where to purchase a part! These shoppers are looking for a dealer locator, showing online retailers or locations of offline brick and mortar stores. Or they’re looking for an auto parts eCommerce website where they can purchase the parts. If you operate an auto parts eCommerce website, this is a big reason you don’t want potential parts buyers leaving to visit a manufacturer website. If they do, parts buyers may find a lot of other options to purchase the product and never come back to your site. They’ll be off, visiting other retailer sites. Or worse, the manufacturer website doesn’t have a comprehensive list of dealers, forcing the shopper to visit Google again to find out where to buy. If you operate a retailer website, make sure you show potential buyers enough information on shipping times or in-stock inventory. Close the sale! Enthusiast parts shoppers want to know what the manufacturer warranty looks like. This is the reason given by 44% of car parts shoppers. This is a good reason for a content audit on your retailing website. If you’re a reseller, do you show warranty information? Do you have your own return policies clearly stated and easy to find? Does your return policy page show your return address or does this raise a red flag with potential buyers because your physical address doesn’t appear anywhere? Your website footer is a great place to put links to these policies and pages. If you’re a manufacturer, do you have your warranty information listed? Do you have a return shipping address? Many parts shoppers don’t think they will see a manufacturer’s entire product line unless they visit a manufacturer’s website according to 43% of auto parts shoppers. That’s a concern if you’re an eCommerce retailer, and that’s a frustration if you’re a manufacturer wanting to increase retail channel sales. Retail websites should look at ways to reassure the consumer if a manufacturer’s entire line is represented. About a third of auto parts shoppers – 35% – come to a manufacturer’s website fully prepared to make a purchase, presumably at full MSRP. This is why selling direct to consumer (DTC) is an attractive sales channel for manufacturers. The inbound traffic potential is there and the gross margin is very high. 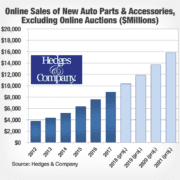 What do you think of these auto parts eCommerce trends? Let us know in the comments below or via Twitter or LinkedIn.